The world's first dual output Ku-band PLL LNBF! Earn 26 SATVantage Rewards points with this purchase! Brand new on the market, this dual output Ku-band universal PLL LNBF features a super low noise figure of 0.1dB with a 40mm throat diameter. Compact, lightweight, weatherproof, this LNBF will deliver years of reliable performance and superb non-drift Performance with +/- 300KHz stability thanks to PLL (Phased Locked Loop) technology. 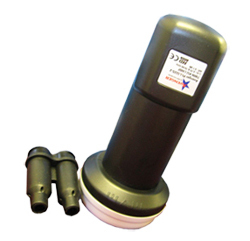 This LNBF also has a long neck for precise focal distance adjustment for any dish size. The Avenger PLL322S-2 also features two voltage regulators, one for each output. This design avoids voltage and current swings and other problems seen in other twin LNBFs. Twin LNBFs that share the same oscillator create stability problems which in turn cause freeze framing, tiling, and other problems. The biggest cause of missing channels during a blind scan is stability problems. The Avenger PLL322S-2 uses two oscillators to maintain rock solid stability.